HELLENIC PETROLEUM Group announced second quarter and first half financial results, with 2Q17 Adjusted EBITDA at €228m (+46%) and Adjusted Net Income at €98m, significantly up compared to last year, while 1H17 Adjusted EBITDA came to €457m (+40%) and Adjusted Net Income to €224m (vs €108m in 1H16). Refining, Supply & Trading performance was the key driver for results improvement, while Fuels Marketing also recorded improved performance. 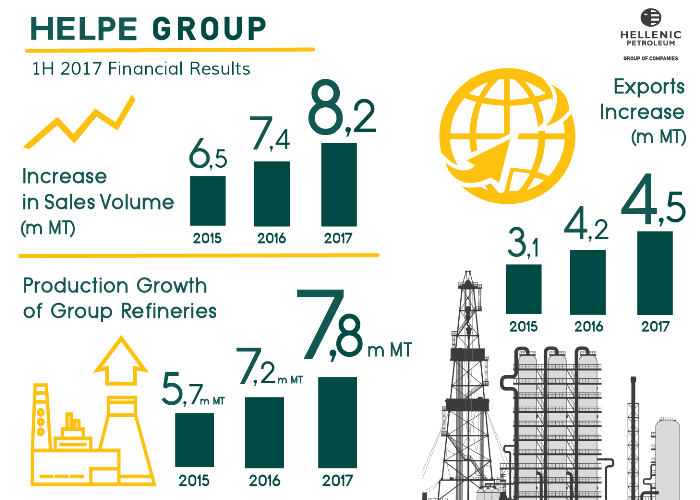 Key factors for the improved results were stronger benchmark margins, increased over-performance vs benchmarks, mainly due to the realisation of opportunities in the Med crude supply and pricing, as well as improved operations and higher production. More specifically, production and sales increased further, with total turnover at 4.2m MT (+7%) in 2Q16 and 8.3m MT in 1H17 (vs 7.4m MT in 1H16), while exports, at 4.5m MT in 1H17 (+7%), accounted for 55% of total. Domestic market sales to aviation & bunkering, were significantly higher, up 20% and 19% respectively while sales to industrial customers were also up. On 31 July 2017, the Group raised an additional €79m with a retap on its existing HPF plc 47/8% October 2021 notes through private placement, with a yield of 3.33%. The transaction was the first, across the major European securities exchanges, to make use of the new capital markets regulation and is in line with Group’s strategy for diversification of the funding base, improvement of financial position and ultimately reduction of funding costs, which in 2Q17 amounted to €42m (-16% vs 2Q16). In terms of Reported IFRS results, those were negatively affected by the decline in crude oil and product prices; as a result, 2Q17 Reported Net Income came in at €44m, vs €72m in 2Q16, with 1H17 NI at €168m (+62%). Recovery of production in Libya, Nigeria and the US led to lower crude oil prices, despite control of output by OPEC member states; as a result Brent averaged $51/bbl in 2Q17, lower vs 1Q17 ($55/bbl), however remained higher than 2Q16. Macro and political developments in Eurozone and the US resulted to the strengthening of the Euro vs USD, averaging 1.12. The notable strength of fuel oil cracks, to the highest level of last years, was the key driver of Med benchmark refining margins, while diesel cracks recorded a small increase. 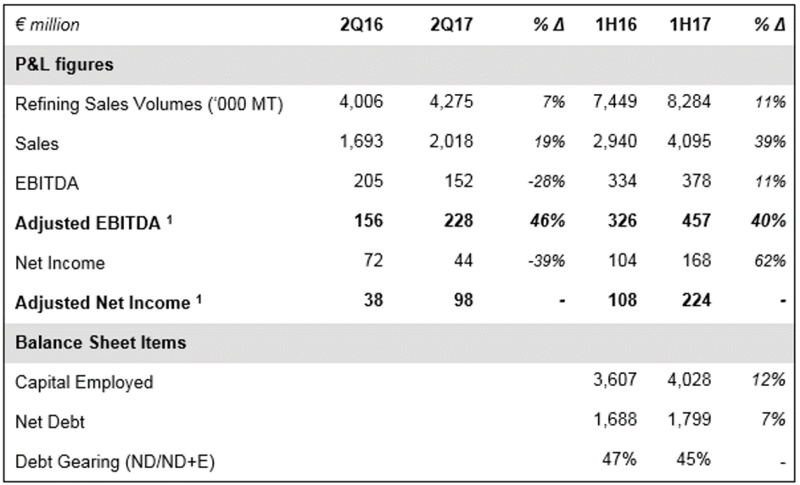 Med FCC benchmark margins averaged $6.1/bbl, significantly higher vs 2Q16, while Hydrocracking came in at $4.4/bbl vs $5.1/bbl last year. Domestic fuels demand was 3% lower in 2Q17, with total volumes at 1.5m MT. The marine & aviation market was higher, as improved market conditions in bunkering led demand up significantly (+23%), while increased tourism flows had a material positive impact on aviation fuels consumption (+12%). The Group’s financial position remains strong with continuously improving key indicators and ratios, as per plan, following the completion of the Group’s strategic investment plan. The repayment of the HPF plc 8% May 2017 notes, the reduction of gross debt to €2.6bn, its lowest levels in the last 4 years, as well as a number of renegotiations of funding cost, were the key drivers of the decrease in interest costs. Operating cash flows (Adjusted EBITDA – Capex) amounted to €382m in 1H17, vs €277m in 1H16, enabling better management of debt obligations and working capital. Net Debt in 2Q17 was maintained at €1.8bn, unchanged vs the last two quarters. In E&P, the planned exploration works at Patraikos Gulf area continued, while the Lease Agreement for onshore areas “Arta-Preveza” and NW Peloponisos” were signed on 25 May 2017, while negotiations for offshore blocks 1 and 10 are in process. Furthermore, HELLENIC PETROLEUM, through its participation to a JV with TOTAL and EXXON MOBIL, submitted an application of interest for exploration in offshore areas off Crete and a tender process from the Ministry on Energy and the Environment is expected. Regarding the 35% participation on DESFA share capital, a sale process for the full participation of the Group and 31% owned by the State was launched, attracting interest from international companies active in the sector. Works for repairing the damage that was reported at Elefsina refinery on 10 July 2017, as well as the extended maintenance schedule which was combined with the repair works at the same time, continue according to plan and the refinery is expected to return to normal operation during September. 1H17 sales came in at 8.3m MT, 11% higher. 2Q17 production amounted to 3.9m MT, with white products’ yield at 84%, unchanged vs last few quarters. Planned maintenance activities at Thessaloniki PP plant had a negative impact on profitability, with 2Q17 Adjusted EBITDA at €24m (-7%), while 1H17 came in at €51m (+2%). Domestic Marketing volumes were significantly higher in all markets for another quarter, leading 2Q17 Adjusted EBITDA at €12m (+6%). International Marketing recorded a small increase in profitability, with 2Q17 Adjusted EBITDA at €14m. 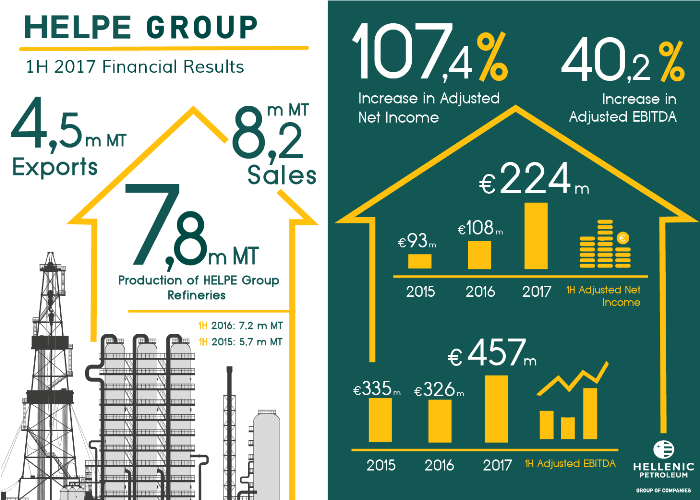 DEPA Group participation to consolidated Net Income came in at €8m, due to higher DESFA contribution, which offset the impact of lower demand from gas-fired electricity generators, as well as other market segments on DEPA results. Elpedison’s EBITDA at €1m in 2Q17, as the flexibility remuneration mechanism was not re-established for gas-fired units. Notes: 1. Calculated as Reported adjusted for inventory effects and other non-operating items.